Jack Skellington was one of my first attempts. Now when I say attempts, I can honestly say, I’ve spent more time and effort making, remaking, and eventually, rebuilding him completely. I’ve learned over mistakes, weather conditions, and moving to different states. But I’m not a quitter and if you compare the first model to the latest, I’ve learned a bit along the way. The Frame: The neck piece is shorter, there is now “feet” instead of just pvc legs. The Clothing: Instead of using black burlap and painting black stripes on, I used striped fabric. I layered with black and white. The Head: The original was made from paper mache on an inflatable ball. It starts out the same, but I do not use any flour in the mache mix ( to prevent mold growth), just white glue and water, and instead of using lacquer and waterproofing spray ( which by the way, didn’t work well), I used clear rubber sealer like the stuff they use on gutters. I’m actually fond of the new remastered Jack Skellington and if you’re a NBC enthusiast, look for my future post on Oogie Boogie – I just completed him this week. If you have any questions on any other aspects, please feel free to ask. 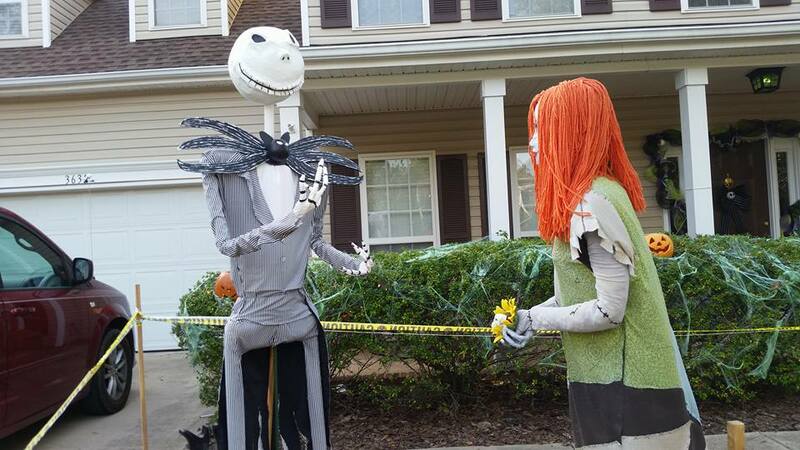 This entry was posted in DIY, How-to-Make Ideas, Props, Seasonal Decorating and tagged DIY, Halloween, How-to, Jack Skellington, Nightmare Before Christmas, Oogie Boogie by thewritegirlforthejob. Bookmark the permalink.